Tyranitar in game: 1,896 Who? Important notice! Pokemon Tyranitar is a fictional character of humans. Mega Tyranitar has more gaps in its armor than its normal form, with four new triangular holes along the sides of its neck and one on its throat. The four on its chest are now larger with the top two containing red ovals. While the spikes along the back of its neck grow shorter, the ones on its head elongate to form prominent ridges along its brows. The center spike on its head becomes a long, upright horn. 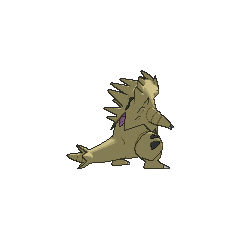 Its chest plate expands, curving over its shoulders and along its back to form three long, irregular spikes on each side of its body. The scales on Mega Tyranitar's belly has now become red instead of blue and seethe with energy, enabling it to emanate more power. 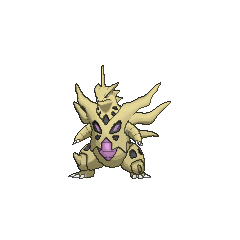 It gains two sharp spikes on its knees, as well as more prominent leg joints. Its tail lengthens, with the three spikes surrounding its tip growing upward and outward. Tyranitar is a powerful Pokémon with an insolent nature. It is extremely strong, and its thick, rocky hide gives it a good resistance to all forms of attack. Because of this, it is always looking for a battle and will not flinch at anything. If enraged, Tyranitar sets off outstanding earthquakes that can completely change the entire landscape, often forcing cartographers to draw up new maps. It lives in nests made from demolished mountains. Tyranitar along with its teammates had a cameo in Pokémon Mystery Dungeon: Team Go-Getters Out of the Gate!. They were considered for the job of rescuing Big Brother Pikachu but were unavailable as they were already on another mission. Tyranitar first appeared in Celebi: Voice of the Forest. It was captured in a Dark Ball and used by the Iron-Masked Marauder. 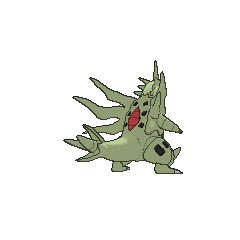 When Ash and company entered the mind of Ash's Larvitar during Address Unown, they saw a vision of Larvitar being separated from its Tyranitar mother. That Tyranitar was seen during the following episode. A Pupitar belonging to Rico evolved into Tyranitar in A Poached Ego. A Tyranitar appeared in Mewtwo — Prologue to Awakening under the ownership of Dirk. A Tyranitar that can Mega Evolve appeared in Volcanion and the Mechanical Marvel, under the control of Levi and Cherie's Mega Wave. 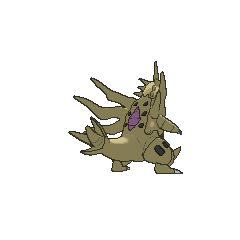 A Tyranitar appeared in Finals Not for the Faint-Hearted!, under the ownership of Alain, where it was used in the final round of the Lumiose Conference against Ash. A Tyranitar appeared in the opening of Pokémon Ranger and the Temple of the Sea under the ownership of Rebecca where it battled against Brendan's Swampert. In Pokémon Ranger and the Kidnapped Riolu! Part Two, a Tyranitar was among the Pokémon used to attack Dawn, Brock, Officer Jenny and Kellyn. A Tyranitar appeared in A Faux Oak Finish!, where it was angry because it had a splinter in its foot. Professor Oak was able to connect with the Tyranitar and pull the splinter out. A Coordinator's Tyranitar appeared in Dressed for Jess Success! participating in the Lilypad Town Pokémon Contest. A Tyranitar appeared in the opening scenes of Zoroark: Master of Illusions. A fake yet realistic-looking Tyranitar was used for a movie in An Epic Defense Force!. A Tyranitar appeared in The Journalist from Another Region!. A Tyranitar that can Mega Evolve into Mega Tyranitar appeared in Mega Evolution Special I. 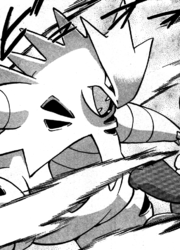 Prior to the events of Volume 8, Silver was given a Pupitar from Lance. 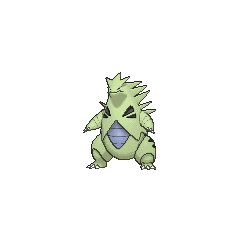 It evolved into Tyranitar prior to Silver's showdown with Gold in Tyranitar War. Silver remarked that Tyranitar's level was so high that "even I can't control it," likely referencing the tendency for traded Pokémon to disobey. Silver eventually returned Tyranitar to Lance, deeming himself still unsuitable to own it. A Tyranitar appeared in A Flaaffy Kerfuffle where it was one of the Pokémon in Professor Oak's fantasy when he explains that Trainers should only have six Pokémon with them. 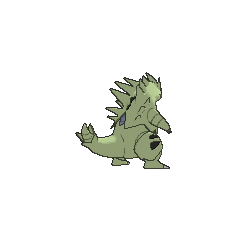 A Tyranitar appeared in The Last Battle XIII as one of the Pokémon sent to help the fight in Ilex Forest. 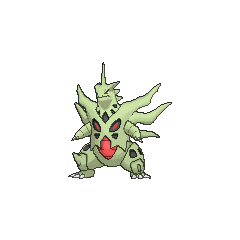 Thorton rented a Tyranitar for use in his battle against Platinum in Uprooting Seedot. Mega Tyranitar has the highest base stat total of all Rock-type Pokémon, tied with Mega Diancie, and the highest base stat total of all Dark-type Pokémon. Tyranitar is the only Dark-type Pokémon belonging to the Monster Egg Group. 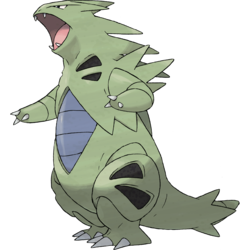 Tyranitar has the most type weaknesses of any fully evolved pseudo-legendary Pokémon, with seven. Tyranitar is the slowest pseudo-legendary Pokémon. 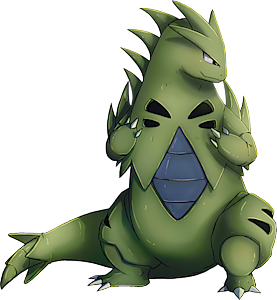 Several of Tyranitar's anime appearances have been in relation to Pokémon poachers. Three poachers owned a Tyranitar while another trio were after one.